Reward excellence with Golf Awards! With our wide array of golf awards we have the perfect award for your golf tournament or the amateur golfer in your life. Our variety ranges from championship cups for tournaments to golf plaques, golf medals, golf trophies, golf glass and acrylic awards, hole-in-one golf ball holders, and much more. 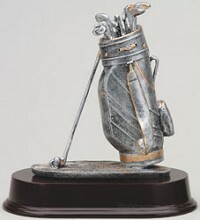 Have your business logo, golfer name, tournament date, and much more put on your personalized golf award. Call or email us today to receive information on your ideal golf award.